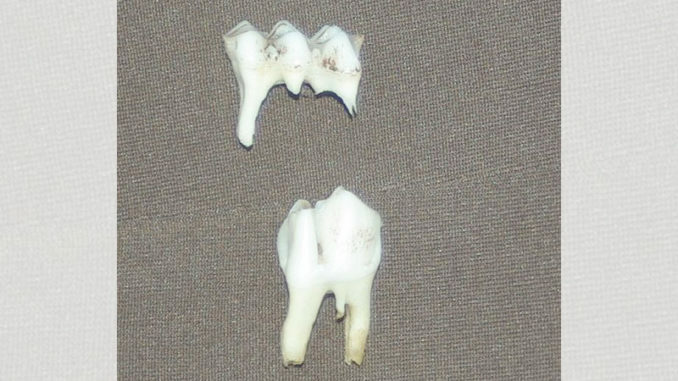 This photo shows the difference between the three-cusp temporary third premolar (top) and the permanent third premolar with two cusps (bottom). Once more keep in mind that in the late breeding areas of the state, tooth eruption and wear is several months behind the early breeding areas. This will be especially true with those deer in areas that are born late, in October and November. This can cause some difficulty in separating the 2- and 3-year-old adults. But again the key for separating adults from yearling deer is the third permanent premolar that now has two crests instead of three. A 2 ½-year-old jawbone will show no wear on the crests of both the third premolar and the third molar. The third cusp of the third molar will be cone shaped with no wear. The typical 2 ½-year-old adult jawbone will have the three fully-erupted premolars and three fully-erupted molars. The two-crest third premolar will now show wear on the two crests. The white part of the tooth is enamel, and I generally tell hunters to look for white touching white at the tip of the crest — an indication this is a new tooth showing no wear. The first and second crests of the third molar should also have white touching white, with the third cusp showing no wear at all (or cone shaped.) When teeth begin to wear the enamel down, a brown strip will begin to appear between the two crests, called dentine. 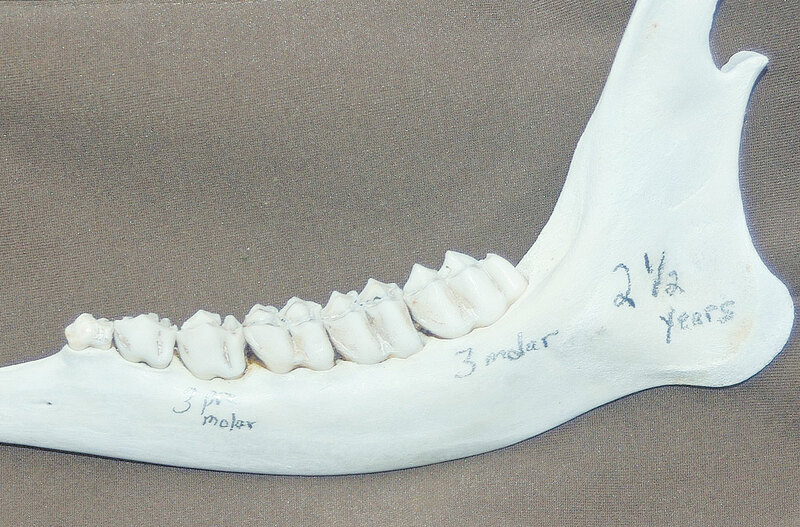 If dentine is present between the crests of the third premolar and molar, the deer is probably older than 2 ½ years. The first and second molar will have slight wear on the crests, with dentine visible between the crests. The food that deer eat plays an important part in tooth wear, as does the type of soil. Deer eating acorns and browse with woody stems will have more wear on their teeth than deer eating soft crop forages or protein pellets. Corn is probably similar to mast. And sandy soils will result in more tooth wear than deer living on clay/loam soils. As deer grow and become 3-year-olds, their teeth will begin to wear on all the crests, and there now will be dentine showing between the crests of the third premolar and third molar. The crests will still be sharp, but the line of dentine is distinct. The third cusp of the third molar will now be worn and cup-shaped. Look at the rear end of the jawbone with this third cusp being the first part of the tooth that you see, and this cup-shaped condition should be evident. These are the keys for separating 2-year-olds from 3-year-olds. Deer that are in the 3-year age class killed in the late-born area may not show distinct wear on the crests, but if there is any wear at all I would suggest moving them up into the 3 ½ year age class. It is generally best to age up rather than down. The 2- and 3-year-old bucks are generally the ones passed up on areas managing for trophy or higher-end deer. However, as I always say, there are low-end deer in all age classes, and hunters need to learn to recognize the bucks below the desired growth trend and harvest them. On the typical hunting club, these 2- and 3-year-old bucks are probably the animals most targeted. Clubs generally use antler growth trends to identify them. Some clubs limit the 2-year-old bucks killed, which generally means more 3-year-old bucks are harvested along with the occasional older buck. Landowners managing for mature bucks, 4- to 6-year-olds, pass the 2- and 3-year-old bucks, again generally using antler criteria. However in our piney woods habitat where nutrition is limited, growth trends will generally be low — and hunters may not see much increased antler growth as deer grow older. Nutrition is the key to a sound and productive management program, especially if hunters are looking for wall hangers.